A mum and her cub approach Jeff and Kayla as they test out the new Atlantis Pacifico SUPs. Vision from Tim Beban, Surfboard Warehouse. A QUEENSLAND surfboard company got the surprise of their life when pods of whales crashed a promotional shoot. 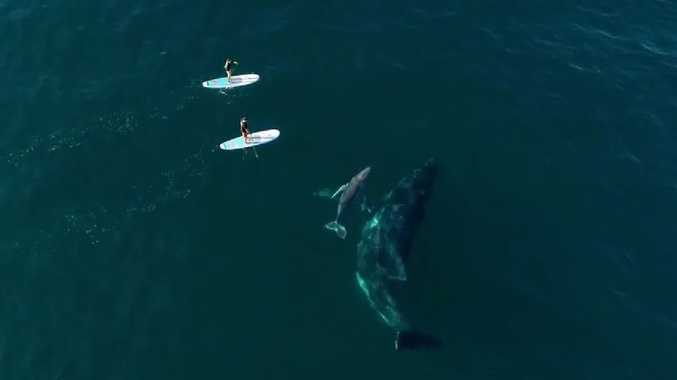 Jeff Weatherall and his wife Kayla were on the water at Hastings Point modelling a new board for local company Surfboard Warehouse when they had a seriously close encounter with multiple pods of whales. "We happened to be right place right time, four of five pods of whales with their cubs came right up to us," Mr Weatherall said. At one point a full grown whale was directly beneath Jeff Weatherall at Hastings Point, Northern NSW. Vision from Tim Beban, Surfboard Warehouse. "Being able to be that close to whales, especially the babies is unreal. "I've done a lot of cool things in my life but that definitely rated right up there." Mr Weatherall is a former professional wakeboarder and paragliding instructor at Byron Bay. But he said being that close to 50,000kg whales was a thrill unlike anything he experienced before. Jeff said it was unlike anything he and his wife had ever experienced before. Vision from Tim Beban, Surfboard Warehouse. 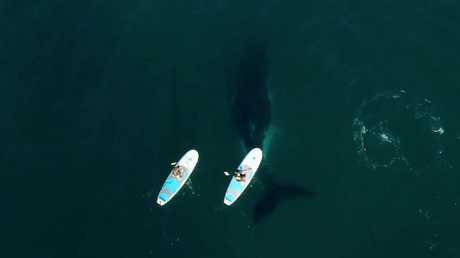 "I've been in the ocean my whole life, I'm a comfortable waterman, but when you're standing on an 11ft paddleboard and there's a 50ft whale cruising at you and under you, it's amazing but a little bit scary," he said. "At one point one was actually underneath me and I was thinking wow we're probably a little close now. 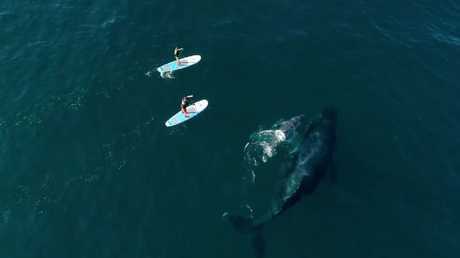 "They are exactly as you'd expect, so peaceful and even though they were so massive you can see in the video they make these big sweeping movements with such grace. "Literally we came in from that and we had to get a bottle of champagne because that was one of the coolest things ever."